Hong Kong tailors are thankful for the textile and garment industries which boost the economy of Hong Kong in the 1960s. Otherwise, it could never become the number 1 financial center in the world. Also, because of those two industries, it gave birth to a group of professional tailors, that stimulated Hong Kong tourism. In addition, the import and export trades triggered by these industries led to several big infrastructure developments. How prosperous the textile and garment industries were? I remember my mother telling me this same story many times before. Not long after graduating from high school, which was around late 1960s, she worked in a Hong Kong tailor's office. At that time, there were many American military passing through on their way to the Vietnam War. She said that troops bought like crazy. They always ordered several suits at a time and would come to pick them up on their way back home. Unfortunately, there were too many that never came back to pick up the suits. In my memory, when I was a kid, maybe around 7, my mom bought many of our clothes from the tailors having them tailor-made. Due to the increase in production costs, many factories moved to mainland China in the 1980s. It left behind many tailors from the last generation. Some of them tried to survive in this tough time. Some moved to the Tsim Sha Tsui (TST) area, which is a tourist must, to continue their business. Here are a couple of Hong Kong Tailors that we have done business with before. We love their services and work. In 2005, we went back to Hong Kong for my sister's wedding. My husband didn't want to buy a new suit here in the States. He thought that he might get some better deals in Hong Kong. After the high-tea in the Peninsula Hotel Hong Kong , we found this tailor (they moved not long after). So, he ended up having one tailor-made. "Man, oh man".....what a suit. The service and design are awesome. 3 fittings within 3 days and we were all done. You don't know how many complements he has received from that suit. These guys travel around the world every year. Once you get one made, they will send you their traveling schedule where you can have another one made at your time in your city. Budget wise, it cost around USD800. If you are not planning to spend that much, look into the option below. This is a mom and pop store. It has a wide variety of fabrics for you to choose from. A pair of tailor-made dress pants ranges from USD50-80. 1) Always call before heading over. They don't have regular working hours. 2) The building they are in may not look very nice. 3) If you have a friend in Hong Kong, bring him/her with you. As the tailor's English may not be the best. There are many other Hong Kong tailors in the Tsim Sha Tsui area. You should shop around first before making your decision. I had 2 experiences of Mainland China tailor-made clothes. There was a period of time that almost all Hong Kong people would spend a weekend to go to Shenzhen to order tailor-made suits. Price was super cheap. We went to the same tailor twice for different orders. One time, everything came out great. The other time, everything was terrible. Since then, we stopped going there. 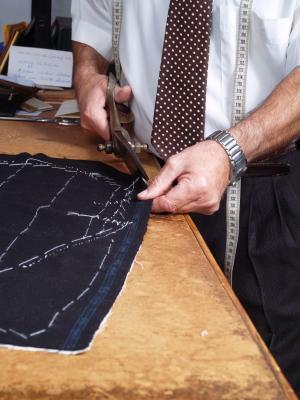 After going to the above 2 Hong Kong tailors, my conclusion is this, "There is no other better tailor than in Hong Kong." You can even search on the web and find out the comments on the forum.